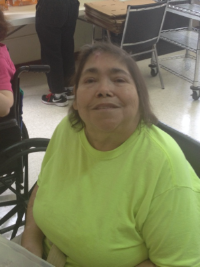 Joy is a hard working woman who works at the Rantoul location as a materials handler. Though she really enjoys doing the work there, her heart is set on making jewelry. In fact, Joy loves making jewelry so much that she started her own side business called “Pure Joy”, making her own necklaces and bracelets. She sells her jewelry at places such as the Urbana art expo and the upcoming Disability Resource Expo: Reaching Out for Answers. She said she would be interested in selling her jewelry at a flea market, and would also like to try making earrings and/or rings too! When she is not busy with her jewelry business, Joy enjoys going out to eat at Butcher Boys to grab a hamburger, or to Family Table to enjoy one of their home-style meals. She also enjoys shopping at Walmart, cooking, and watching Law and Order on television. She also likes going to the movies to watch action or comedy movies. When asked where she would go if she could go anywhere in the world, she replied that she would like to visit Niagara Falls, Canada again. She had gone a few years ago with friends, and recollects how beautiful it was at night with all the lights shining over it.